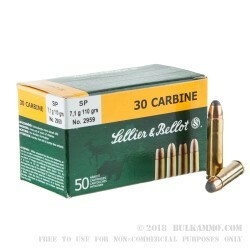 Whether it's hunting or range training you're headed out to do, this 30 Carbine Sellier & Bellot ammunition will fulfill your needs. 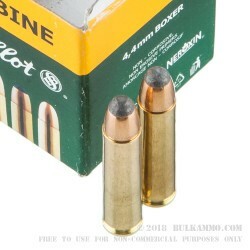 The 110 grain soft-point bullet is an excellent option for all types of varmint hunting, as well as deer, as slower expansion and deeper penetration will help secure your kill. 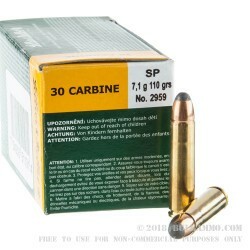 They are popular at the range due to the precise shot they delivery into the target. 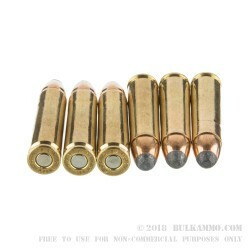 The casings are made of brass to reduce corrosion, and have boxer primers. Sellier & Bellot ammunition is made in the Czech Republic and is one of the oldest and most reputable companies in the world. Their beginnings date all the way back to the 1825 when French merchant Louis Sellier began making percussion caps for infantry firearms at the request of the Emperor of Austria. Today, they produce over 1 billion cartridges per year.